If you get bored with windows startup sound like me and want to change it safely without damaging your windows file, you can use the software below. You just need to get your favourite sound / song in WAV format. It is a small portable tool called 'Startup Sound Changer' , As per his name , it changes the startup tone very easily without changing or corrupting any other file.Just unzip this file and click Replace, select your favorite file and all done !!! Now your computer will start playing your favorite song. 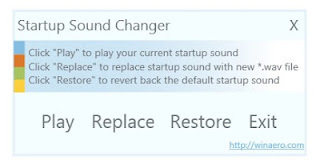 If you want get back to old windows startup sound , just click on Restore. This software is of 317 kb in size and it is compatible with Windows Vista and later versions of windows.